You are here: Home > [Updated] Nexus One Users Waking Up To Froyo? [Updated] Nexus One Users Waking Up To Froyo? Update: Engadget is confirming that their own Nexus One has received the device along with various reports popping up on twitter also reporting Froyo update availablity. Apparently this night is different than all other nights as Nexus One users are waking up to a treat. Well at least some of you are as Google has apparently begun rolling out the Froyo Update to Nexus One users. This is quite unexpected, as Google had just stated at the end of Google IO that it would drop in the “coming weeks” and I suppose they really meant at the end of the coming week. I can see how someone could easily mistake “coming weeks” and end of the week. Honest mistake. Of course, it’s really only just a few one individual(s) receiving this so its possible that a widespread update is still “weeks” away and this is merely a fluke, a test or a tease. Until we can confirm, take all this with a grain of salt but in the meantime, N1 users, watch your phones like hawks. This would be great if it were true but I call shenanigans. I wish I weren’t though. I hate yogurt but I want me some Froyo. sorry but, putting this out based on only one individual is not very ethical if u ask me, and u didn’t. specially since i didn’t get the update, cause only one douche got it. wow Safil, clearly you are very jealous you did not get your update yet but I don’t see anywhere in the article about only 1 person getting the update. It clearly states that SOME people have recieved the update. This does not make the author unethical at all. Idiot. The BEST part of waking UP… is FROYO in your cup!!! LOL. Hopefully one of my buddies at work received his update today because I am interested to check it out. Especially the hotspots wifi feature. Makes me wonder though… if Tmobile doesn’t approve tethering does that mean any version of Froyo on a Tmobile branded phone would be missing these features? Kinda bad… and almost makes the Nexus One worth getting unless they somehow put a block on it. I wouldn’t be surprised if they charged even more for data on phones that could offer this feature. Hopefully the Slide will have it intact when it gets Froyo. …. but some odd reason I doubt it will. USB and bluetooth tethering have been available for a long time by using http://www.junefabrics.com/android/ It works great on my Nexus One. Tethering is enabled and working on an unlocked nexusone with tmobile. The wifi hotspots works well and has a range of about 50 feet from my testing. The browser is much faster. Other small tweaks and I’m still looking at all functions. Overall I am impressed with the build. Turned on the N1, 6 updates, no FROYO!!!! Still waiting……. I call bs as well. I hope I am wrong of course but honestly I dont think I am. Google would have said it was going live, that would have generated a great deal more interest. Although, flash beta 10 is available…why would Adobe release it if no update is expected for weeks.. I think the n1 is comming out on June 4th with the mytouch slide. Where did you get this info? Is that confirmed or just a guess/rumor? This was confirmed by Engadget. They got the update on their N1. So who is posting the manual update so I don’t have to wait anymore!!!!!!!! How are notifications sent? If over the cell company’s 3G network then should I disable WiFi until I get the notice? WiFi disables 3G on the Nexus One, when it’s in range. DUDES IS ANYONE ELSE HAVING ISSUES WITH THEIR N1 TODAY? I AM! So based on the endgadget reports this article should be updated to say that “review units received the update”. That makes sense that they would push the update out to people who are going to post articles about it before sending it to the masses. That way those articles get written before they have to do the tap dance required to push the update out over the network without bringing down cellular networks. NEW Android 2.2 FroYo is here!!! Downlod now!!! The update is located on XDA, everyone should know they always find a way to get what they want…they have the link so its for non-rooted phones as of 1:24pm pct…so us rooted users are either gonna have to wait or go back to stock. The 2.2 ROM is already available for a manual update. There’s a link in the thread on Engadget, as well as at XDA. I’m already updated. Looks like KGB-SPY beat me to it. No worries. I’m just excited to have froyo installed. Voice dialing via bluetooth is a super nice (and overdue) addition. FroYo is fast. I loves it. Yes, I spelled loves with an s.
Downloading and updating now… I’m so excited :-). Thanks!!! Froyo in the house… I’m loving it!! you wouldnt be running a MAC would u also? Can you manually update the mt slide with this link or is it strictly for the n1? also androidandme.com has instructions for it and the download link..my friend just updated it and she said it runs superfast wow im jealous i dont have a nexus one yet..
Love it! Running Froyo through the manual install on my Nexus One! It has to be turned on by developers using the new SDK, so it doesn’t work for any apps yet. Where do you find the option for this that is greyed out? I looked under the sd card options and I don’t see any option for it. Sometimes it’s good to be the chosen child, the special one, and in the eyes of Google the Nexus One is that special phone — at least for the moment. As such it seems to have been given a special treat: access to Froyo, earlier than expected. 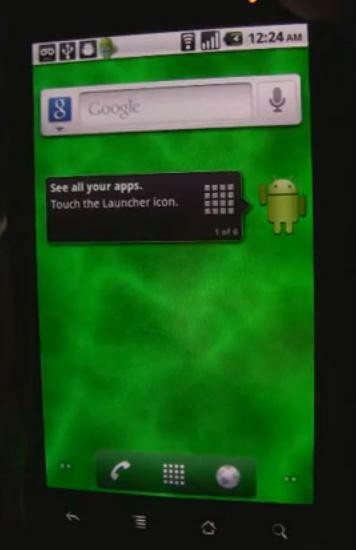 TechCrunch’s MG Siegler is reporting that his handset received Android 2.2 overnight. So far we’re not hearing too many other reports of folks seeing this update, but that could be thanks to everyone sleeping off a week of exciting announcements. Sound off in comments if you’re waking up to this frosty, low-calorie snack. Update: We’re not sure how this is being rolled out, as hardly anyone is seeing updates, but via Droidnytt we found a number of reports on Twitter that people are indeed seeing the update. Update 2: Count us among the lucky few who just received the OTA Froyo update, to our original T-Mobile-based device. Update 3: We’ve done some additional investigation, and as far as we can tell, Google is only updating review Nexus Ones that had been provided to the press — not off-the-shelf phones. We’ll stay on this and let you know more as soon as we do. Based on initial review at Engaget of 2.2, Flash still does not have GPU assist yet. the manual update is much easier than i thought. i am wondering why when i go to certain sites it still says i need flash update. Hulu, etc. Finally got home and installed FROYO It’s just finishing now,,,, took me a couple tries to figure out but was pretty easy…..
ITS TRUE GUYS FROYO IS A BEAST,,,, I’M NOTICING ALOT OF LITTLE CHANGES TOO THAT ARE MAKING THE PHONE SO MUCH MORE USER FRIENDLY, BUT ONE THING YOU HAVE TO DO IF YOU DO THE UPDATE IS GO DOWNLOAD ADOBE 10.1 IN THE MARKET,,, THERES JUST ABOUT NO SITE I CANT GET TOO,,, INCLUDING GAMES,,,, I.E. ADDICTING GAMES .COM EVERY GAME HAS WORKED SO FAR ON MY N1 ITS SICK AND THE PHONE IS RUNNING SO SMOOTH….. TAKE IT FROM ME I’VE DONE THE MANUAL UPDATE AND THERES NO ISSUES…. I did it! After lots of thinking… between the Nexus One or the MyTouch Slide… I finally caves it and bought a Nexus One outright. True its a lot of money but that just means I am guaranteed to keep my same plan as well as not be tied down to a contrtact. Plus after all these months the hardware is still top of the line and with Froyo. Released its like a whole new phone! I can’t wait to try this baby out especially with the tethering option. That’s one of the selling points for me and I wouldn’t be surprised if Tmobile took it out of the MyTouch version of Froyo.